Xarelto, one of the newest anticoagulants, or blood thinners, is usually prescribed to help patients prevent blood clots and to protect them from strokes. It is also used to treat atrial fibrillation, pulmonary embolism, deep vein thrombosis, and to prevent abnormal blood clotting in patients who must undergo hip replacements or knee surgery. Blood clotting, if not treated, could have serious consequences, such as stroke and even death. Xarelto was first approved by the Food and Drug Administration (FDA) in 2011. However, the drug, created by Bayer and Johnson & Johnson’s Janssen Pharmaceuticals, has been known to cause irreversible internal bleeding that can lead to death. Since its approval, Xarelto has been linked to hundreds of injuries and deaths, mostly due to serious hemorrhaging. While the drug was supposed to help prevent blood clots, many patients have reported that the drug caused blood clots to develop in their bodies. Some studies have also found that Xarelto increases the risk of bleeding for acutely ill patients and, unlike its rival Warfarin, Xarelto does not have an effective reversal agent. Warfarin can be reversed with a dose of Vitamin K--so doctors are able to quickly stop bleeding in their patients. This is not the case with Xarelto. Despite the dangers of extreme adverse side effects, including severe bleeding and death, the usage of Xarelto continues to increase and the Germany-based company continues to profit. At Friedman, Rodman & Frank, we believe it’s our civic duty to notify the general public about the dangers of this drug. 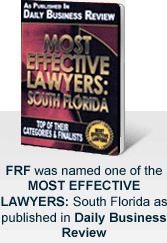 Many people have sought the services of a Miami defective product attorney and filed suit against the makers of Xarelto. The main Xarelto lawsuit claims that Bayer and Janssen Pharmaceuticals concealed important safety information about the drug and did not test it properly before putting it out on the market. It also claims that the company produced a defective product by releasing the drug without an antidote. This is a very important fact in the case because several patients have reportedly died due to the inability of doctors and other medical professionals to reverse the bleeding in their patients. Because of the large quantity of lawsuits filed, this case has been consolidated into a multidistrict litigation (MDL), which helps simplify the process because several cases can be handled by the same judge in the same court. Those involved in MDL lawsuits are able to keep their own lawyers, and their cases are still handled as individual lawsuits. Xarelto follows in the footsteps of another blood-thinning drug called Pradaxa. Many deaths and reports of serious bleeding were linked to Pradaxa. Hundreds of patients and their loved ones also filed lawsuits against the makers of Pradaxa. In May, the makers of Pradaxa paid $650 million to settle thousands of lawsuits involving the drug. It should be noted that Xarelto has been approved for even more uses than Pradaxa. If you or a loved one has taken Xarelto and experienced abnormal bleeding or worse effects, it’s imperative that you contact our Miami defective product attorneys immediately. You and your family could receive money for loss of wages, loss of earning capacity, medical bills including emergency visits and ongoing care, as well as for emotional distress and pain and suffering caused by Xarelto and for funeral expenses in the unfortunate case of death. We firmly believe that the makers of this drug should be held accountable for its release to the public who was not warned of its dangers. The Miami defective product attorneys at Friedman, Rodman & Frank would like to help you receive the benefits that you rightfully deserve. Contact us today for a free consultation at (305) 448-8585, toll-free at (877) 448-8585, or fill out our online form.